Facebook help us to be in touch with our friends, family members and other people even when they aren't close to us. You might have hundreds of friends on Facebook. If someone finds you annoying, he/she can unfriend you any time. This will prevent future communication between two accounts and they won't be able to see each other's profile, timeline, tags and other things. Facebook doesn't send any message or notice to the people when they are unfriended by someone. It's completely confidential. After checking your friend list, you may find that some of the people are no longer friend with you. So what happened to them? Saying that they have unfriended you is completely wrong at this point. There are three possibilities. Either they have unfriended you, blocked you or deactivated their own account. If you've will to know that what actually happened, then this tutorial will guide you how to investigate the case and find out all those people who has unfriended you. 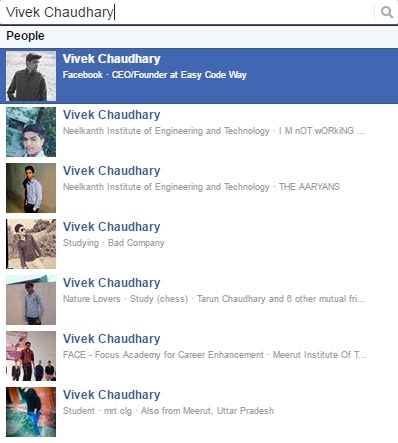 First thing you've to do is to search the person name in your Facebook friend list. Just go to your profile and move to "Friends" tab. If you find him, this means that the person is still a friend with you and thus you don't need to worry about anything. If you don't find any results, there is clear sign that the person has either unfriended you or blocked you. Now lets take this investigation a step ahead. Now search the name of the person on Facebook. If you can find them and their is a "Add friend" button on their profile, this means that the person has unfriended you surely. On the other hand, if you don't find the profile in search results, just logout your Facebook account and search them directly once again. This time, you may find their profile. If yes, then the person is active and most probably, he has blocked you. Sometimes, you won't be able to find the right person after logging out. This is because, their may be thousands of people with the same name and Facebook has no reference to show people who have mutual friends. If you don't find it, this doesn't means that the person isn't active. Last but not least, try to find their profile by searching them from your different account. If you don't have any, create a new one or use your friend account. Make sure that it has few mutual friends with the person. If you can access their profile, this means that the person is active and most probably, he has blocked or unfriended you. Note: Some people hide their profile from Facebook search so that no one can find them directly. Their privacy setting is adjusted in such a way that only mutual friends and the people who search them with email address or mobile number can find their profile. If you won't be able to find the person, don't give up and continue your investigation with other ways. After visiting the link, if you'll find a "Add friend" button on their profile, this means that the person has unfriended you. On the other hand, if it shows an error message or redirects you to the Facebook homepage, then the person has blocked your account. To know the actual reality, visit that same link from different account, especially from one which has mutual friends. Also, try to visit it while logged out. If you can find their profile, there is a high chance that they've blocked you. Now again run above experiment and find whether you can access their profile or not. You can ask your mutual friends for this issue. Simply leave a message for them asking whether the person is active on their account or not and when did it come online last time. You can also ask your close friends directly face to face whether the person is using Facebook or not. Or it is just you who got unfriended? This will surely give you right answer. Some people clean their Facebook friend list to control an online addiction or simply to cut out all those friends who are no longer in touch. Don't get disappointed. Relax, just leave them and enjoy your own life. What is Facebook Jail and what to do when account is blocked? There are number of third-party apps and websites available which can help you to find out who has unfriended you on Facebook easily. You just need to give an app permission to use such tools. One of the most popular app is Who Unfriended Me. You can download it from Google Play Store or directly visit their website (search on Google). Unfortunately, you can't find old data using these tools. Only after installing them, they will track your friend list and let you know who has unfriended you time to time. After setting up the account, you just need to wait for some time. Although third-party tools are great but still I don't recommend you to use them, especially if there are other manual ways. Such apps eat unnecessary space in phone memory and on the other hand, their is risk of being hacked. Now a days, many spam websites are available and hackers are trying different ways to trap victims. You don't know which site is actually safe or not. This is another interesting method to find out all those people who has unfriended you on Facebook. You don't need to use any third-party tool. Facebook keep record of all your account data (such as friend list, photos, videos, activities etc.,) and good thing is that, you can also download this data manually. The basic logic behind this tricks is very simple. You just need to download this account data at two different time and then compare them with each other to find out who has unfriended you in that particular time period. To download your Facebook account data, first go to "Settings" and under "General" tab, click "Download a copy" option. Now follow on-screen instructions. You also need to bypass a simple security check in order to download this file as it contain some private account information also. After downloading the archived file, simply extract it and then check your friend list. Next time, if you want to find out who has unfriended you, simply download this Facebook data once again and compare it with your old report. You've to search each person one by one. If someone is missing in second data report, this means that the person is no longer your friend. 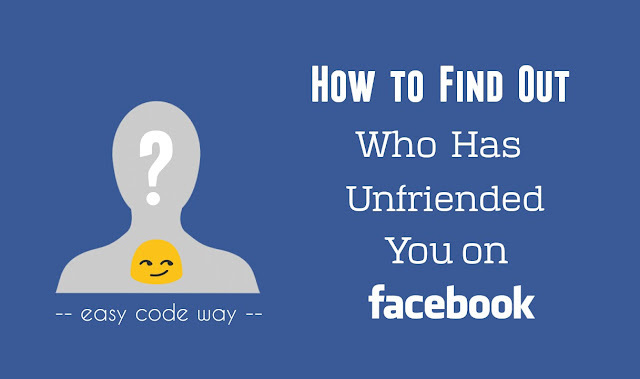 In this way, you can easily find out who has unfriended you on Facebook. If you've any questions, feel free to drop them in below comment box. Do you know any other better way to investigate this case? Do likes decrease After changing the username ?